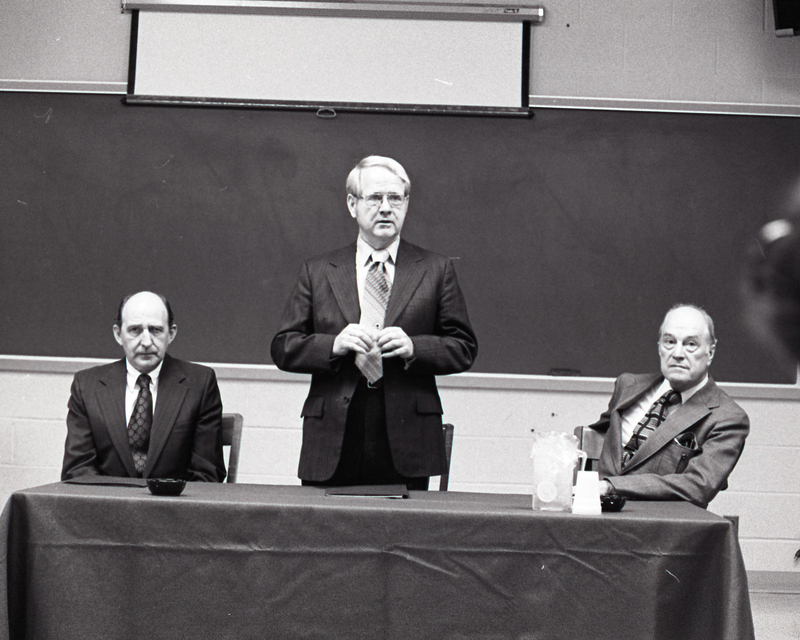 Photograph of the newly named president of George Mason University, Vergil H. Dykstra (center), addressing the George Mason University community and the media, April 3, 1973 in Finley Hall. On the right is former president, Lorin A. Thompson, while on the left is Rector of the Board of Visitors, John C. Wood. 8" x 10" photograph print; black and white. Citation: University Relations, George Mason University , “Dr. Vergil H. Dykstra is announced as president of George Mason University, April 3, 1973 ,” A History of George Mason University, accessed April 24, 2019, http://ahistoryofmason.gmu.edu/items/show/175.